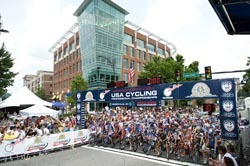 The Greenville Hospital System USA Cycling Professional Championships will return to Greenville, S.C. for a fourth consecutive year in 2009, with race weekend set for August 29-30. The dual championship has become one of the premier cycling events in the Southeast, with the USA Cycling Professional Time Trial Championship on Saturday and the USA Cycling Professional Road Race Championship on Sunday. USA Cycling, Inc., which sanctions the event, has extended the licensing agreement for 2009 with Medalist Sports, a sports marketing company that specializes in planning, promotion and management of multi-day, multi-jurisdiction sports. Medalist Sports has produced the event since 2006. The Greenville Hospital System USA Cycling Professional Championships is part of the 13-event schedule for the USA Cycling Professional Tour. It is also one of 17 national championship events that USA Cycling sanctions across five disciplines in the sport for amateurs and professionals. "The amazing community support we have had since moving the pro Championships to Greenville in 2006 is one of the main reasons to stage the event in the Upstate for another year. A strong foundation has been built with the help of Greenville Hospital System as title sponsor, the City of Greenville and Greenville County," said Chris Aronhalt, managing partner of Medalist Sports. "These championships provide a first-class venue for the best professional cyclists in the country, and we expect several exciting announcements and the development of new platforms with regard to community and corporate involvement." In 2009, the GHS USA Cycling Professional Championships will continue its relationship with the Palmetto Peloton Project (P3) and host special events to support cancer research. In the past three years, $278,000 has been raised with non-competitive running and cycling events in conjunction with the Championships. Funds from the Stars and Stripes 5K Run and 1-Mile Run/Walk and the annual Stars and Stripes Challenge bicycle ride have benefited the Greenville Hospital System Oncology Research Institute, Lance Armstrong Foundation and Activate Upstate. "Greenville Hospital System is proud to serve as title sponsor of the USA Cycling Championships for a fourth year and to be a recipient of the Palmetto Peloton Project," said Greenville Hospital System President and CEO Mike Riordan. "We are grateful to P3's gift to cancer research because it not only impacts the people in our community but people across the country and around the world. In addition, P3 events, such as the bicycle rise and 5K run, offer our community an opportunity to get out and be active, which reinforces our commitment to total health." All updates will be made available at the official website: www.usacyclingchampionships.com. Established nearly a century ago, Greenville Hospital System University Medical Center (GHS) is a not-for-profit academic health organization committed to medical excellence through research, education, clinical expertise and technological advancement. GHS is accredited by the Joint Commission of Accreditation of Hospital Organizations (JCAHO). With five campuses and 1,268 licensed beds, it is one of the largest not-for-profit healthcare providers in South Carolina. GHS provides comprehensive healthcare through its flagship tertiary referral and education center (Greenville Memorial Hospital), two acute-care and one long-term care hospitals, short-stay surgical hospital, integrated children's and women's hospitals, nationally-recognized cottage-concept nursing home, outpatient facilities, wellness centers, community outreach programs and extensive medical education program that includes 11 residency/fellowship programs. GHS currently offers more than 570 clinical trials, including several first-in-nation cancer-treatment trials. To learn more, go to www.ghs.org. The Palmetto Peloton Project (P3), based in Greenville, S.C., exists to promote the advancement of cancer research and advocacy efforts locally, regionally and nationally through fundraising events. Through support from local businesses and enthusiastic cyclists, the Palmetto Peloton Project has raised over $330,000 for cancer research and advocacy since its inception in 2005. In 2009 as part of the Greenville Hospital System USA Cycling Professional Championships, P3 will host the "Stars and Stripes Challenge", recreational cycling and running events to support local cancer research. For more information, visit www.palmettopelotonproject.org.